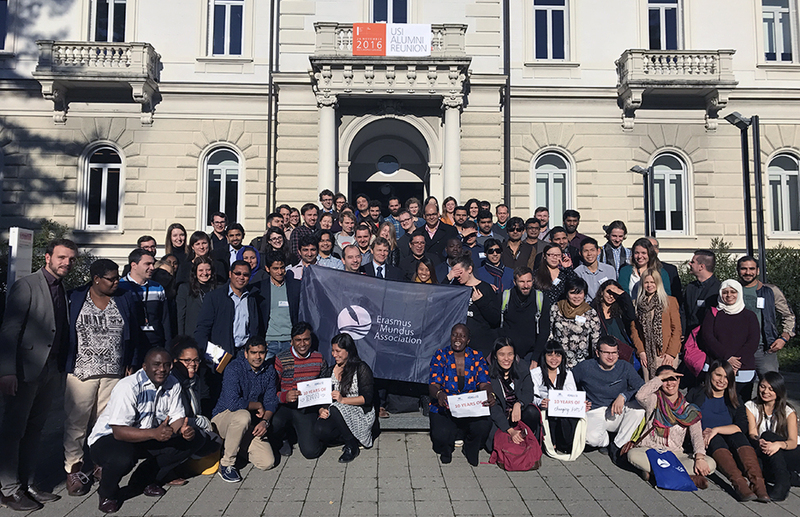 The Erasmus Mundus General Assembly 2016 was held in the picturesque city of Lugano, Switzerland, next to the beautiful glacial lake Lugano. This year marked the 10th anniversary of Erasmus Mundus Alumni Association, which was founded in 2006. The General Assembly followed on the long and successful tradition of previous events that were held all over Europe in Perugia, Vilnius, Madrid, Budapest, Prague, Barcelona, Krakow, and Ghent. The event was organised at the main building of Universit della Svizzera italiana (USI). USI Lugano proved a fabulous host, and provided a very warm welcome to the attendees. Though we wish the weather was as kind, the beautiful sunny day on Sunday let the attendees enjoy the city and the beautiful lake. The event kicked off on the evening of Friday 25th November with the Networking Boat Cruise at the Lake Lugano. The Erasmus Mundus students and alumni coming from all over Europe and the world got a chance to mix together, many haven’t met for more than a year, since the last General Assembly in 2015 in Ghent, Belgium, many haven’t met at all. The shining lights of Lugano provided a beautiful backdrop to rekindle the Erasmus Mundus spirit as the night wore on. The opening ceremony started on Saturday 26th November with the welcome address by the current EMA President Apiyo Okwiri. This followed up by the video message from Martine Reicherts, Director-General of DG Education and Culture, European Commission, and the talks by Adrian Veale and Bodil Agasoster, representatives from European Commission, which highlighted the importance of Erasmus Mundus programme and the useful role played by EMA. Prof. Boas Erez, USI Rector, and Cristina Zanini Barzaghi, representative from City council of Lugano, then welcomed the EMA participants to the city of Lugano. Apiyo Okwiri and Emrah Karakaya, the current Vice-President of EMA, discussed the details of EMA GA 2016, introducing the facts and agenda for this year’s General Assembly. This was followed by two interesting talks on USI Highlights. Prof. Paulo Goncalves, Founder and Director of the Master in Humanitarian Logistics and Management (MASHLM) and Master in Humanitarian Operations and Supply Chain Management (MASHOM), and Co-founder and Chief Strategy & Operations Officer (CSO/COO) of SwissLeg, gave an inspiring talk about “Challenges and Rewards of Social Entrepreneurship” and discussed many success stories from the USI students and alumni. Prof. Natasha Sharygina, Associate Professor at Informatics Department, USI, talked about “International Studies and Projects of the USI Informatics Faculty”. The first session ended with presentations from EMA partners, that was moderated by Pavan Sriram, EMA Former Vice President. There were talks by Viviana Premazzi from garagErasmus, Wim Gabriels from Erasmus Student Network (ESN), and Robin Heinsen from OCEANS. After the coffee break, Apiyo Okwiri and Emrah Karakaya opened the second session with introducing key players of the EMA, the EMA structure and who is who of EMA. Then there was a plenary discussion on “Erasmus Mundus, EMA History and Today”, which was moderated by Leasa Weimer, EMA Former President. The panelists, who shared their experiences from the founding days and through the formative years of the EMA, included Hanneke Luth, the first EMA Former President, and Apiyo Okwiri, the current EMA President, and Adrian Veale from EC/EACEA, and Boas Erez, Rector of USI, both of whom were course coordinators of some of the very first Erasmus Mundus Masters courses. Then Mikhail Balyasin presented the findings from “EMA Course Quality Survey Report”. The session concluded with a video message from Georgiana Mihut about the organisation of EMA GA, and discussion on highlights of the EMA GAs, and insights into the agenda by Apiyo Okwiri and Emrah Karakaya. The first day of General Assembly continued in the afternoon after the lunch break with an interesting plenary discussion “Forum of Inspiration”. The session was moderated by Hanneke Luth and Leasa Weimer, both EMA former Presidents, where distinguished EMA members discussed their Erasmus Mundus journey and success stories. The session covered personal anecdotes from Ekaterina Matveeva, CEO of Amolingua, Geline Alfred Fuko, a lawyer and human rights activist in Tanzania, Kenneth Toah Nsah, a teacher, writer, and youth and literary student, Gratian Mihailescu, Founder of UrbanizeHub, Raj Sark, Founder and CEO of LUPO, Hayati Citaklar, lecturer, writer, and artist, Besiana Balla, PhD fellow in Economics, and Jennifer Lenhart, programme manager at WWF. The session was followed by the now legendary “World Coffee Break” which was a huge success like the previous years. EMA regional chapters exhibited the sweets, cuisines, and flavours from their countries, and the participants got a chance to taste the dishes from the world over. After the coffee break, there were five training and workshop sessions in the afternoon, which covered various interesting topics for personal and professional growth. The highlight of the night was the “Gala Dinner” at Capo San Martino, an old restaurant perched up the hill with fascinating views of the lake and the city of Lugano. After enjoying the gastronomic delights of the region, the time was ripe for the “Cultural Show”, now a mainstay of the EMA General Assembly. Each of the regional chapters dressed in their traditional attires showcased their regional music and arts with amazing dance performances. Kul Shanker Shrestha opened the night with his guitar playing to the mystic tunes from the mountains of Nepal. Sanja Zivanovic ended the show with an enthralling performance of middle eastern belly dancing. But the main highlight and surprise of the night was still left, the announcement of EMA Stars of the year 2016. Mushfiqul Alam took the stage and congratulated everyone for playing their part in the success of EMA. He, in particular, lauded the tremendous efforts of the three individuals, who put in a lot of hard work in organising EMA General Assembly 2016 and other EMA activities. The whole of EMA congratulate Bailey Harrington, Amir Kamran and Agegie Kn for being the EMA Stars of 2016. The agenda of the second day was devoted to the EMA internal affairs. Apiyo Okwiri opened the session with providing details about the activities planned for the second day. Nathan Lemahieu, from Internal Affairs team, then presented the proposed Statute Amendments, and coordinated the voting on these amendments. Emrah Karakaya then discussed the strategy and the timeline for planned EMA activities for year 2017. After the short coffee break, it was now the time for chapter meetings. Lucia Loposova coordinated the meetings of the African, Chinese, Eurasian, European, Far East, Indian, Latin American, Middle East, North American, Oceania, South Asian, and South East Asian chapters. After the regional chapters, members of the different Service Teams, Advisory Board, and Networks, met to discuss and plan for the upcoming year. The general assembly concluded with the Closing Ceremony, where Apiyo Okwiri discussed about the way forward, and thanked and bid farewell to all the participants. This year’s EMA General Assembly proved to be a resounding success, and was covered on national and local media, for example on RSI television and radio channel, and on Teleticino television channel. The live updates and photos were also shared widely on social media, using #EMAGA2016 hashtag on Facebook, Twitter and Instagram. The report on EMA General Assembly was written by Amin Khan, in collaboration with Maryia Kukharava and the Communications Team at EMA. The final version of the report appears on EMA website. 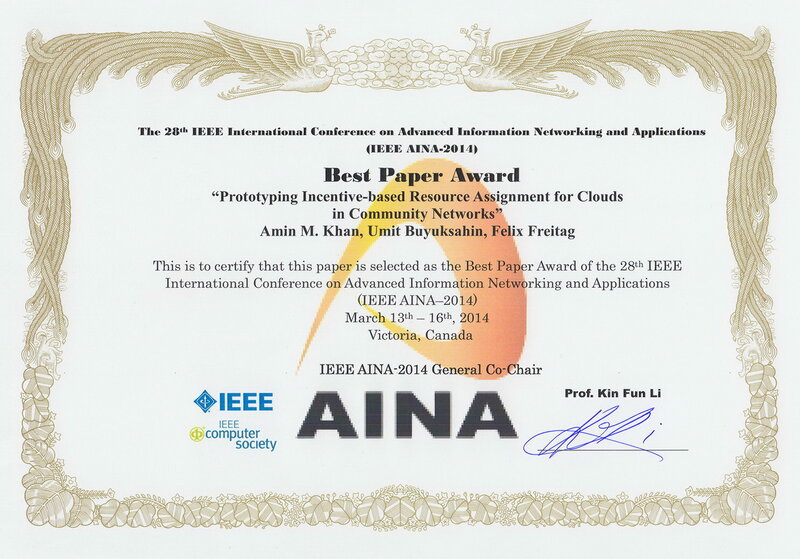 Check out the video explaining the concept behind realizing clouds in community networks. The CLOMMUNITY project aims at addressing the obstacles for communities of citizens in bootstrapping, running and expanding community-owned networks that provide community services organised as community clouds. That requires solving specific research challenges imposed by the requirement of: self-managing and scalable decentralized infrastructure services for the management and aggregation of a large number of widespread low-cost unreliable networking, storage and home computing resources; distributed platform services to support and facilitate the design and operation of elastic, resilient and scalable service overlays and user-oriented services built over these underlying services, providing a good quality of experience at the lowest economic and environmental cost. Here is a shorter version with the animation video. Here is a short presentation about Xen hypervisor. Barham, Paul, Boris Dragovic, Keir Fraser, Steven Hand, Tim Harris, Alex Ho, Rolf Neugebauer, Ian Pratt, and Andrew Warfield. “Xen and the art of virtualization.” In ACM SIGOPS Operating Systems Review, vol. 37, no. 5, pp. 164-177. ACM, 2003. 6th IEEE International Conference on Emerging Technologies (ICET’10) was held from October 18-19 at FAST National University of Computer and Emerging Sciences (FAST-NUCES), Islamabad, Pakistan.